Provided photo Cinderella, portrayed by Lauren Riley, listens to advice from her late mother, portrayed by Kirstyn Lee of Piqua. 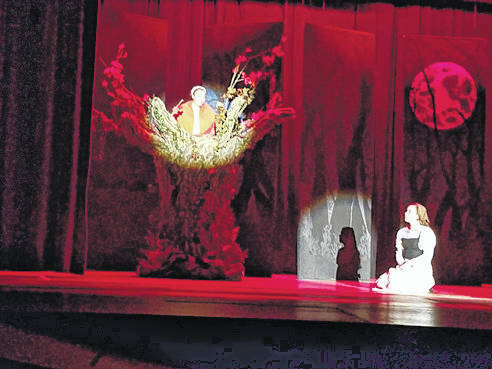 SIDNEY — Lehman Catholic High School will present its 41st annual all-school musical, “Into the Woods,” April 11, 12 and 13, at the school. 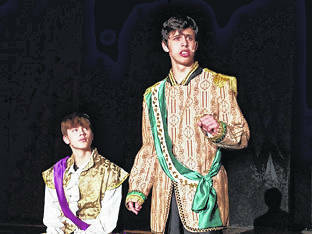 The Thursday night performance begins at 7 p.m.; the Friday and Saturday performances are at 8 p.m.
“Into the Woods” is an original story from the team of Stephen Sondheim and James Lapine. Along with well-known characters from Grimm fairy tales — Cinderella, Little Red Ridinghood and her wolf, Jack and his beanstalk, the Princes Charming, Rapunzel and a witch — the story introduces two new characters, a baker and his wife. Unable to have children as a result of the witch’s spell, the baker and his wife interact with all the familiar characters as they roam the woods in an attempt to “have the curse reversed.” The “quest” fairy tale leads at first to a happy ending, but in Act Two, an angry giant terrorizes the kingdom, and the characters learn lessons about life, survival and how wishes don’t often come true without consequences. Playing the lead role of the baker is Conor O’Leary, son of David and Emily O’Leary, of Sidney. Playing the baker’s wife is Carianne Rindler, daughter of Dean and Linda Rindler, of Sidney. The witch is played by Sarah Gibson, daughter of Joseph and Sonia Gibson, of Tipp City. Jack is played by Casey Topp, son of Gregg and Angie Topp, of Minster. Jack’s mother is Maddy Wiseman, daughter of Tom and Lori Wiseman, of Sidney. Playing Cinderella is Lauren Riley, daughter of David and Jackie Riley, of Sidney. Her prince is Elijah Jock, son of Dan and Melissa Jock, of Sidney. Little Red Ridinghood is played by Annie Stiver, daughter of Jason and Gwen Stiver, of Sidney. Playing the wolf is senior Elliott Gilardi, son of Marc and Colleen Gilardi, of Troy. The mysterious man is Aidan Snyder, son of Jon and Betsy Snyder, of Troy. Playing Repunzel is Carly Edwards, daughter of Joe and Tina Edwards, of Sidney. Her prince is Tommy Hamlin, son of Dan and Katie Hamlin, of Troy. Cinderella’s stepmother is Jacquie Schemmel, daughter of Bill and Alicia Schemmel, of New Bremen. The stepsisters, Florinda and Lucinda, are Liz Gibson, daughter of Bruce and Pamela Gibson, of DeGraff, and Evie Olding, daughter of Bryan and Sara Olding, of Sidney. Playing the steward is Alex Vanderhorst, son of Jerry and Angie Vanderhorst, of Sidney. In the role of Milky White is Max Schmiesing, son of Greg and Christina Schmiesing, of Sidney. Sharing the role of the narrator are Aaron Topp, son of Gregg and Angie Topp, of Minster, and Ryan Gibson, son of Mike and Julie Gibson, of Sidney. Members of the ensemble playing other roles are Elias Bezy as Cinderella’s father, Kirstyn Lee as Cinderella’s mother. Emily Fogt as Sleeping Beauty, Taylor Reineke as Snow White and Maria Schmiesing as Granny and the voice of the giant. Other members of the ensemble are Kaylyn Armstrong, Maggie Bezy, Alexis Bollinger, Emily Bornhorst, Angela Brunner, Kiera Burns, Anna Cianciolo, Taylor Cooper, Michael Denning, Ethan Derryberry, Sophia Flood, Andrea Hughes, Elizabeth Jock, Mary Lins, Brooke Perry, Sophie Ratermann, Agnes Schmiesing, Kia Smith, Heidi Toner, Liann Trahey, Brieanna Werling and Emma Westerheide. Production staff for the show includes Bill Zimmerman Jr., director; Ryan Jenkins, musical director; Emily Pax, accompanist and assistant musical director; Tricia Zimmerman, choreographer; Ryan Wendel, house manager; Elaine Schweller-Snyder, production consultant; and Darla Cabe, costume consultant. Adult committee heads are Jon Snyder and Kevin Schmiesing, construction; Linda Rindler, makeup; Anne Schmiesing, cast meals; Melissa Jock, props; Tina Armstrong, refreshments; Jackie Riley, flower sales; and Tina Edwards, cast party. Schweller-Snyder and Ryan Wendel are handling tickets, program, ushers and publicity. Musicians are Emily Pax, piano; Grace Schmiesing, violin; Rachel Birman, flute; Kaye Hummerickhouse, bassoon; Schweller-Snyder, trumpet; Alex Blosser, horn; Chad Heffelfinger, trombone; Wendel, bass; Mary Beth Monnier, synthesizer; and Ken Monnier, percussion. The student crew is led by student director and stage manager Joe Ritze. Ella Gover is in charge of the soundboard. Other crew members are Hezekiah Bezy, Ryan Armstrong, Lily Greene, Kate Stewart, Brenden Werling, John Wesner and Kyle Wick. Tickets for “Into the Woods” are $10 for reserved seating (floor) and $8 for general admission (bleachers). Tickets are available at the door or by calling 937-381-9497.
https://www.dailycall.com/wp-content/uploads/sites/30/2019/04/web1_Cinderella-Lauren-Riley-listens-to-advice-from-her-late-mother-Kirstyn-Lee-1.jpgProvided photo Cinderella, portrayed by Lauren Riley, listens to advice from her late mother, portrayed by Kirstyn Lee of Piqua.